Our long-time partner, Motorola, just celebrated 90 years of delivering essential lines of communication to teams all over the world. From their first car radio to the only end-to-end command center software suite, Motorola’s drive for innovation is what makes them the leading provider of mission-critical communications and video surveillance. For over 30 years, Nova Communications has paired our engineering and technical expertise with Motorola’s industry-leading portfolio to provide best-in-class service in Eastern Canada. As a Motorola Solutions Platinum Partner, our team has access to the most advanced wireless voice and data communications systems and services. Not only has our partnership with Motorola enabled us to become the largest communications systems integrator in Atlantic Canada, we are also Canada’s number one online two way radio dealer. Together, Nova Communications and Motorola Solutions make supply chains visible to retailers and entire power grids visible to utility workers. We build customized communications and software systems for first responders to access real-time data that improves their situational awareness and response time. Paul V. Galvin and his brother, Joseph, incorporated Motorola’s founding company, the Galvin Manufacturing Corporation. Their first product was a battery eliminator that allowed battery-powered radios to run on household electricity. The Motorola radio was introduced as the first commercially successful car radio. The brand name Motorola was created by linking the words “motor” (for motorcar) with “ola” (which implied sound), to mean sound in motion. The Motorola Police Cruiser radio receiver was created as a rugged one-way car radio, designed to receive police broadcasts. Motorola radios entered the home entertainment market with a line of phonographs and home radios. The first complete line of low-cost, dependable Motorola AM two way radio equipment was created. The objective was to make affordable radio equipment for public safety agencies to help them improve service to their communities. 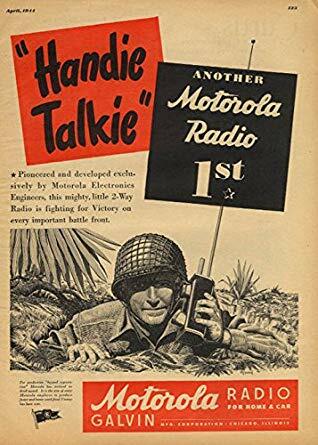 The Handie-Talkie SCR536 AM portable two way radio became the iconic handheld radio for World War II. Police cars were equipped with the first Motorola FM mobile (car) two way radios. The world’s first FM portable two way radio, the SCR300 backpack model, was designed for the U.S. Army Signal Corps. The walkie talkie radio weighed 35 pounds and had a range of 16 to 32 kilometers. Motorola communications equipment carried the first calls on Illinois Bell Telephone Company’s new car radiotelephone service. Due to the small number of radio frequencies available, the service quickly reached capacity. 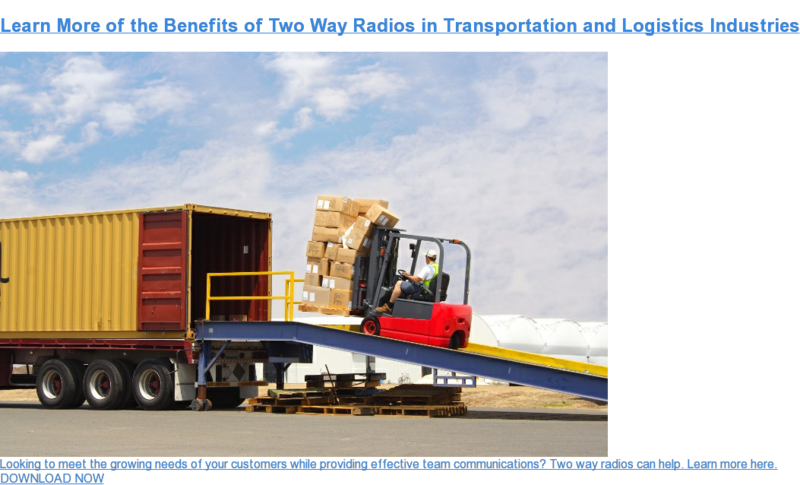 A new line of portable and dispatch vehicular two way radios were designed for the industrial market. This was the year Motorola also introduced a line of Golden View table model televisions. The Motorola Foundation was established to support leading universities in science, technology, engineering, and math (STEM). The Motorola germanium transistor for car radios was the world’s first commercial high-power transistor. It was also Motorola’s first mass-produced semiconductor. The Handie-Talkie radio paging system was also introduced in the same year. This system provided individual paging inside hospitals, factories, and office buildings, reducing noise from public address systems. The Motrac radio was the world’s first vehicular two way radio with a full transistorized power supply and receiver. Its low power use enabled users to transmit without running their vehicles’ engines. The Motorola Astronaut television was the first large-screen, transistorized, cordless portable television. The transistorized Handie-Talkie HT200 portable two way radio was small and lightweight for the time, weighing in at 33 ounces. It was nicknamed “the brick” because of its shape and durability. The world’s smallest prototype pocket television receiver was created, called the “Tiny Tim TV”. A Motorola radio transponder relayed the first words from the moon to Earth in July 1969. The transponder aboard the Apollo 11 lunar module transmitted telemetry, tracking, voice communications, and television signals between Earth and the moon. Motorola’s 1972 MODAT mobile data radio system allowed users in vehicles to transmit and receive data from dispatch computers. Public safety officers could enter license plate information during traffic stops. Motorola introduced the world’s first portable cellular telephone and system. The first public calls using Motorola DynaTAC (DYNamic Adaptive Total Area Coverage) technology occurred in New York City. The 8-bit MC6800 microprocessor was used for automotive, computing and video game applications. Motorola designed the MX300 series of portable two way radios that included status, identification, and emergency alert features that were compatible with computer-aided radio dispatch systems. The DVP Digital Voice Protection system was the first digital encryption technology to provide two way radio users with a high degree of voice communications privacy. The RDX portable data terminal system combined scanning and communications technology. Data could be captured by scanning, voice or keyboard input, and then transmitted wirelessly to a central computer. The Motorola DynaTAC phone was the world’s first commercial handheld cellular phone. Motorola also developed a radio network, later named ARDIS, that allowed IBM service technicians to use Motorola KDT800 portable two way data radios to communicate with host computers. Motorola invented the Six Sigma quality improvement process to provide a common worldwide language for measuring quality. Motorola received the 1991 National Medal of Technology for U.S. President George Bush. Motorola was recognized for the advancement of the American electronics industry through continuous technological innovation, establishing Motorola as a world-class electronics manufacturer. The same year, Motorola introduced the ASTRO two way radio system as the world’s first narrowband digital public safety radio system. Tango was the first two way personal pager. Users could receive text messages and email, and reply with a standard response. It could also be connected to a computer to download long messages. Motorola began alpha testing a TETRA radio system and was awarded the contract for providing the system to the new Oslo Airport at Gardermoen, Norway. Motorola tested the world’s first 700 MHz wideband high-speed data system for public safety users, enabling advanced mission-critical communications. Motorola was awarded the National Medal of Technology for over 75 years of technological achievement and leadership in the development of innovative electronic solutions. Motorola was recognized for making portable and mobile communications to become the standard across society. Motorola’s MOTOMESH wireless mobile network was one of the first multiradio mesh networks to combine 4.9 GHz licensed mobile broadband radios and unlicensed Wi-Fi radios into a single access point. Mesh networking enabled public safety users to rapidly create a network of wireless devices linked in a relay system. Motorola introduced MOTOTRBO professional digital radio systems to integrate voice and data applications and increase system capacity. Motorola developed the APX family of Project 25 multi-band two-way radios and the Inter RF Subsystem Interface (ISSI) gateways between live Project 25 public safety networks. Motorola also announced the launch of their over-the-air Long-Term Evolution (LTE) data session in the 700 MHz band. The ES400 Enterprise Digital Assistant (EDA) was designed for mobile workers to combine voice, data, scanning, and GPS in a durable, light-weight device. Motorola also announced their 802.11n WiNG 5 WLAN wireless network architecture. The new network featured intelligent access points, reducing the number of controllers needed. Motorola was awarded the contract to create the first statewide broadband LTE public safety network. Motorola introduced the world’s first handheld public safety LTE device, the LEX700. The device combined rugged hardware and powerful software with the ability to connect with public safety LTE, cellular, IP, and P25 networks. Upon acquiring Airwave, Motorola expanded to become the largest private operator of a public safety network in the world. Our partnership with Motorola, along with our decades of experience in engineering wireless solutions, gives our team the confidence and pride that we will continue to deliver industry-leading communications technology that shapes the future. To find out more about the Motorola products and services we offer, contact a member of the Nova Communications’ team of certified specialists.